An account from the Soviet Union, 1965. In February, 1965, a bus full of people was going towards a city. Next to the driver there was sitting an old man with a white beard, tall, and full of vigor.He wore a heavy coat with a fur collar, and a fur cap with flaps. The bus was going slowly because of the snow which was falling outside. At one turn, the chains of the back wheels came off. The bus skidded and almost collided with another full bus. All these things happened very quickly. The driver lost control of the bus, and everyone's heart jumped. Finally the two buses halted at a distance of barely three-quarters of an inch apart, without any mishap. Then the old man made the sign of the Cross and cried out: "Glory to Thee, O Lord, glory to Thee! Blessed be thy name, O All-holy mother of God, who has saved us . . ." In a few moments the other bus left. The driver and his assistant went out to put on the chains. Smiling, one young man opened a conversation with the old man. "Forgive me elder," he said, "but I could not hold back from laughing when I heard you call upon the non-existent Heavenly Powers and saw you make your Cross. Habit, of course, is second nature. I see that you wear the distinguishing mark of a scientist. But in our times, in the year 1965, it is an incongruity." The conversation attracted the attention of all. The old man, without becoming troubled, said, "Gladly, My young comrade, shall I answer you. And if you want I shall make a self-criticism . . . Wherefore, do you know what I think? All of us are somewhat hypocrites. All of us pretend that we are atheists, dedicated members of the Party, with profound knowledge of Marxism and many other things. And yet there comes a moment every once in a while when the real man expresses himself. Behold, just as it happened even now! This mishap was sufficient to demonstrate it. Since you sit in that place, you of course did not see what happened behind you. I, however, who sit sideways, saw at least another eight or ten making their Cross. It is something within us which we will never be able to uproot, because it would be like uprooting our very bowels. Thus, every day all of us fall into 'errors-—that is, we remember that there exists a certain great, unknown, and good Power Whom we pretend to ignore . . ."
"I assure you that this personally never happens with me," said the young man. The old man chuckled and said, "You will permit me to prove you false, beloved comrade, because just previously you said, 'These things in our times, in the year 1965, are an incongruity.' What was the reason for you to remember that one thousand nine hundred and sixty-five years have passed from the time when the Savior of the world, Jesus Christ, was born!" "This," said the young man after having been taken aback a little, "is an evil remnant of an evil past, which must definitely be wiped out. The way you are speaking, you are going to convince us that even miracles take place!" The old man was silent some moments, and afterwards said, "Yes my beloved one, there are even miracles of God which you yourself will believe, just as all that are here will also believe. When, however, you see them, you will be obliged to keep silent because, if you speak, there is danger that they will close you in some psychiatric clinic." The bus had come into the main artery. The heavy snow stopped and thus the driver was able to increase the speed. At one moment, all—as many as were looking at and listening to the old man—saw his place empty! Two or three that were close to his seat made the sign of the Cross, saying, "Holy, holy is God the Almighty." One of them turned toward the back of the bus and shouted, "Do you understand now who saved us from the collision? He himself, the old man with the white beard, was the Protector of our People . . . Saint Nicholas!" 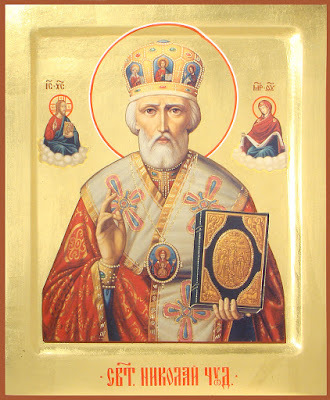 "I do not know what we are going to do comrades," said one other in the meantime, "but wherever I may be, I am going to tell of this miracle of Saint Nicholas! And let them lock me in a psychiatric ward if they can. I have you all as witnesses; and especially you, comrade . . ." The young communist covered his face with his hands for a long time. After about two hours, the bus stopped and all got down to drink hot tea. The young communist approached several of his fellow]passengers, full of emotion. He asked for their addresses. He also gave them his. All the other others did the same among themselves. "Do you know what I purpose, comrades?" said one young woman, "Let us not lose contact with one another. This which we saw today and heard with our ears is a great thing. Very great. What can it forbode? Certainly something good, because the little old grandfather was the Protector of our People." The above miracle was written by an eyewitness. "I cannot write more," he says, "because I am overcome with emotion and am weeping. I also was on the bus." From Contemporary Miracles in Russia by Archimandrite Haralambos Vasilopoulos, 1966. Translated by Holy Transfiguration Monastery, Jamaica Plain, Massachusetts. Published by Orthodox Life, May-June, 1967.